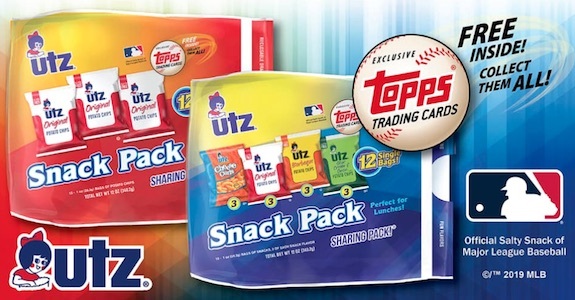 If you normally see Utz chips on the shelves, check your snack aisle for 2019 Topps Utz Baseball promo cards. Just don't get any chip grease on the cards when you are opening them. A common sight for those in the eastern portion of the United States, the regional chip brand is a staple of grocery stores and convenience stores across the East Coast. The specially-marked Snack Pack bags each include a pack of exclusive MLB cards. Every pack contains four cards and a Topps coupon. 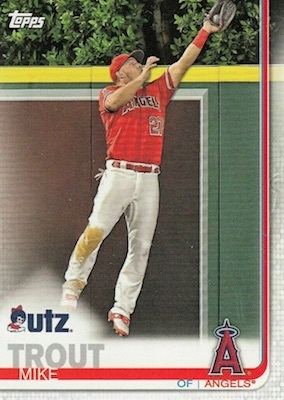 Utilizing the 2019 flagship baseball design with an added Utz brand logo, the 2019 Topps Utz Baseball checklist features 100 players. There are a few rookies in the bunch, plus superstar Mike Trout as well as Rookie Cup cards for Juan Soto, Ronaldo Acuna Jr. and Shohei Ohtani. While the difference is minimal compared to the Series 1 cards and they all appear to have the same images from the flagship set, the cards do work with unique numbering in addition to the added logo. Still, at just four cards per pack, collectors will have to eat a bunch of chips to build the full 2019 Topps Utz Baseball set. 100 cards. Buy cards on eBay. 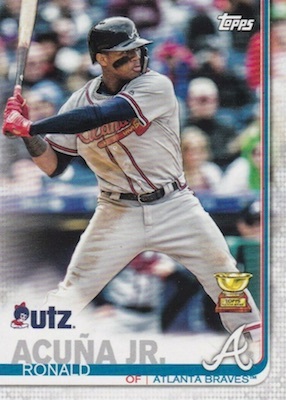 2019 Topps Utz Limited Edition Pack Ronald Acuna Jr. + 3 More Cards! wish there was more widespread variations available for direct purchase on the west coast like these. we have no UTZ packs like these, we have no Meijers for the purples. have to rely on ebay and elsewhere at most likely inflated prices. I know walgreens will eventually have yellows and there still are the targets and walmart variations. I love this brand of chips & now I have an even bigger reason to go purchase a few bags or maybe a case of them for the baseball card packs. LOL!